Current Query: By Type Update. Lee Archer	for checking the manuscript and providing additional information on historical vehicle models. Bob Fleming	for checking the manuscript and providing additional information on preserved vehicles. 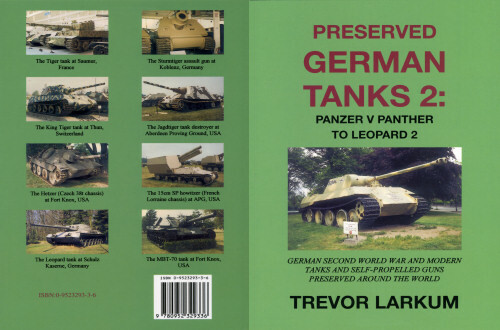 Mark Hayward	for supplying a copy of his manuscript on the Jagdpanther and for providing additional information on the Panther and Jagdpanther. Sanzo Takemiya for providing the diagram of the 12.8cm Panzer Selbstfahrlafette V SP gun. Any remaining errors are entirely the responsibility of the author. All photographs are from the author’s collection unless otherwise credited. Special thanks, therefore, go to those who provided missing photographs and made this book more complete than it would otherwise have been, including Tim Royall, Ed Storey, Heiner Duske, Jim Kinnear, Michael Boyden, John Harris, Ingvar Blomquist, David Brittain, Prof. F. Derom, and James M. Holmes.